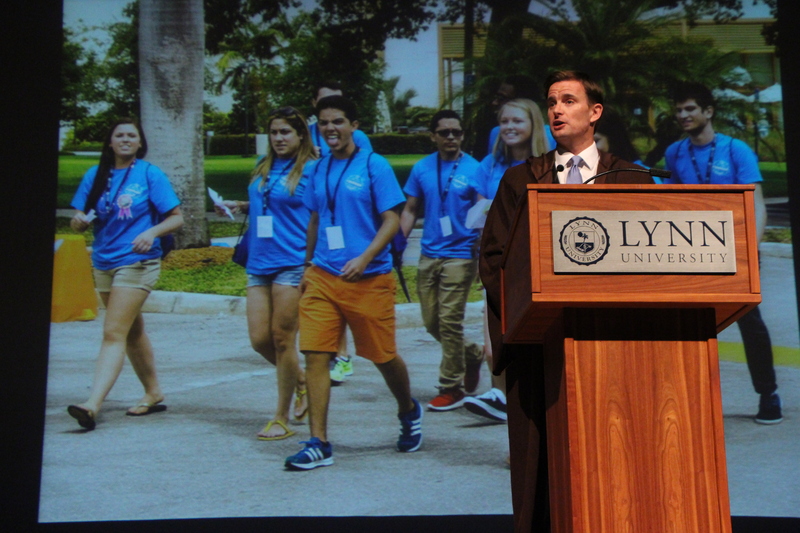 Above: Lynn President Kevin Ross at the State of the University address. Stock Photo. While Lynn loves to know why students are choosing the university as their own, a more important question has appeared recently: Why are you staying at Lynn? To answer this question, students are responding with #WeAreLynn. As the social media age has surged over the past several years, there have been many hashtags that have accompanied Lynn related posts. Until now, students have had a hard time figuring out how to distinguish Lynn, but with the newly formed #WeAreLynn, they can now take pride in their school on social media. In Lynn’s Office of Admission, two staff members have been working hard on this new hashtag. Social Media Coordinator Neci Dodd and Associate Director of Enrollment Management and Lynn alumna Taryn Hamill had several students write down ideas for the new hashtag and have worked from there to choose the right one. With this year’s incoming freshman class being the largest it has been in eight years, Lynn has the highest potential right now for student spirit and this hashtag embodies everything that is Lynn. At the Star Wars themed State of the University Address this past Wednesday, Hamill revealed that Lynn is becoming students’ top choice for an institution. When parents and potential students look at Lynn’s website, they will see that Lynn currently has a 69% retention rate and a 41% graduation rate. While there are a lot of big Lynn events that people have been attending this week, the hashtag is also for the everyday encounters students have that make them proud of the school. Students have already started using the hashtag on Facebook, Instagram and Twitter to tell stories of why they chose to stay at Lynn. Stories included the involvement the university has provided, the family aspect of the school and the affordability of the 3.0 Program. Those who want to see more about #WeAreLynn can check out the hashtag on any Lynn related social media sites.